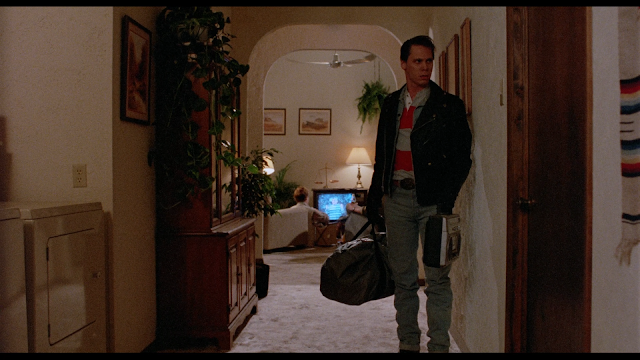 Arrow Video brings the proper version of this 80's classic to blu-ray in a Limited Edition and a Regular Edition. 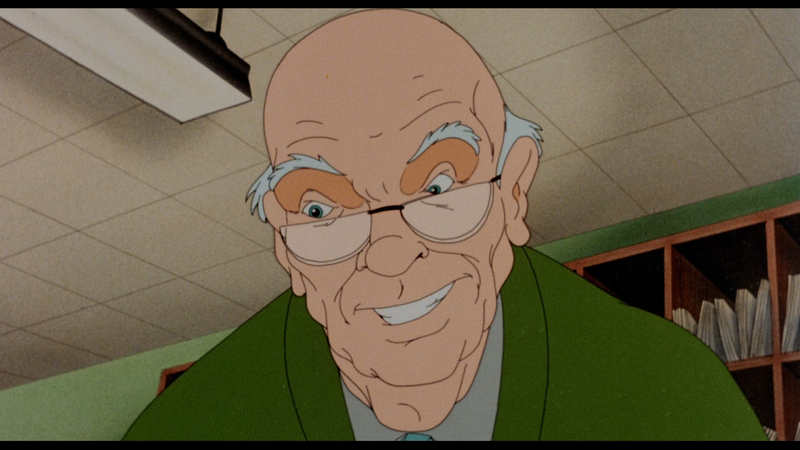 Is this blu-ray worth your money or can you just stick with the older blu-ray? Keep reading to find out. 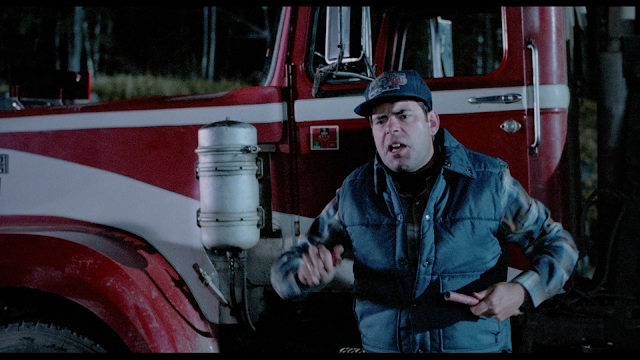 George A. Romero, who wrote the script for Creepshow 2, talks about his involvement with this film as well as what drew him to the project in the first place. (other than being the director of the first film). He talks about reading comics as a kid and how his favorite comics were the EC comic series. 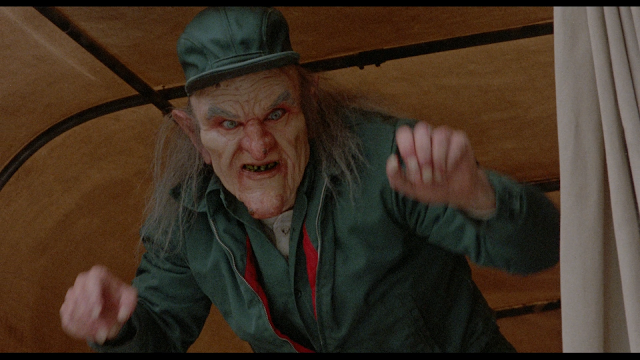 We learn that the original Creepshow is the only film of Romero’s to reach #1 at the box office. We also learn that he would love to do another Creepshow. This featurette was produced for the 88 Films blu-ray. Daniel Beer, who stars in the short The Raft, talks about his time making the film. He talks about how he got hypothermia during filming and all of the restrictions he faced when he returned to the set. His story is really interesting because there is a lot of info of hypothermia that I did not know. This interview was recorded, for this blu-ray release, in October of 2016. 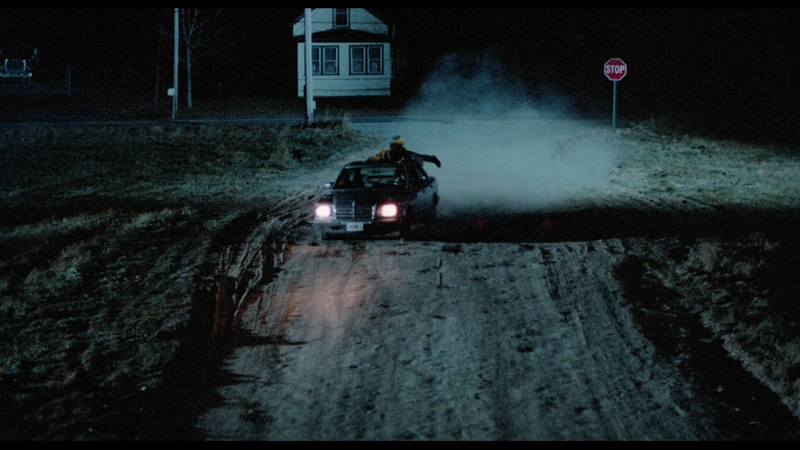 Tom Wright, who plays the hitchhiker in The Hitchhiker, talks about his time on set. While he is an actor, he is also a credited stuntman, which was one of the reasons he got the job. 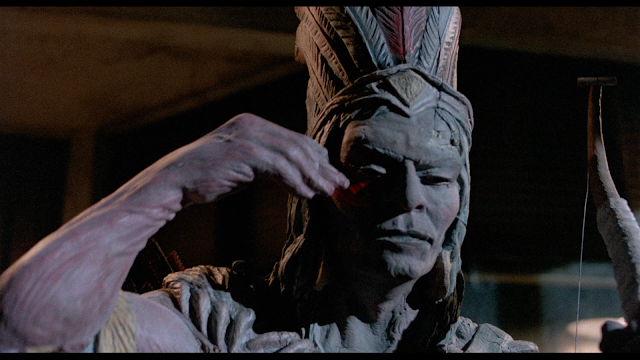 He talks about the make-up and how the stunts were done. This interview was recorded, for this blu-ray release, in October of 2016. As soon as this interview started and I saw who the actor was, I knew I had seen him somewhere. While watching this interview, which is pretty good, I remembered that he played the politician in Tales from the Hood. 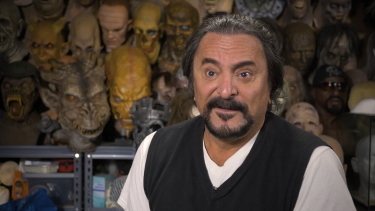 SFX Artists Greg Nicotero and Howard Berger talk about their history of working together. They also talk about working on Creepshow 2 and how they were the guys everyone set came to. 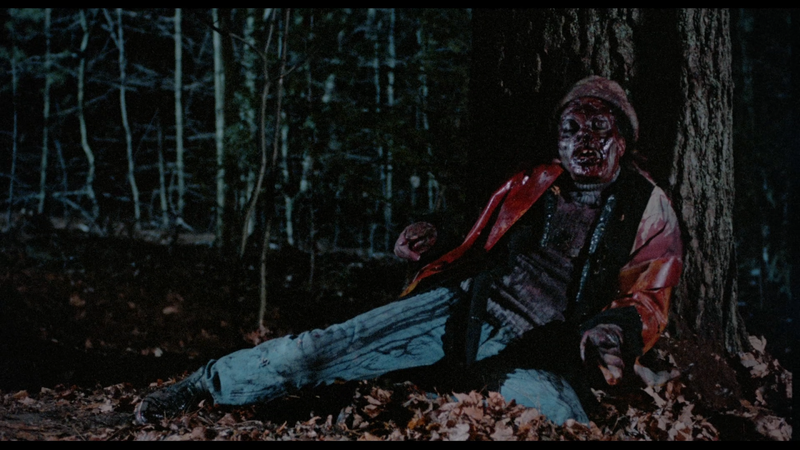 Lots of behind the scenes footage accompanies this featurette, which was recorded for the dvd release from Anchor Bay. 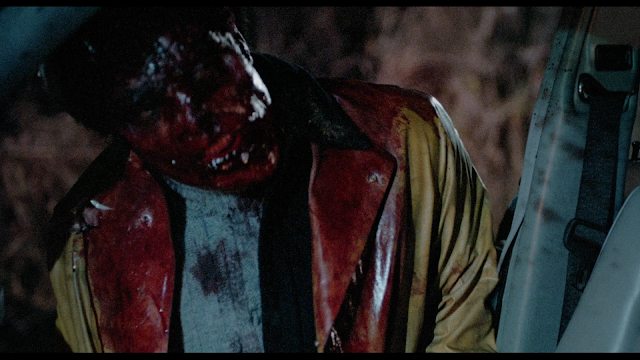 VHS footage of Tom Savini getting put into the Creeper make-up and of him shooting his scene. Portions of the film’s score play over a montage of images taken from the film. 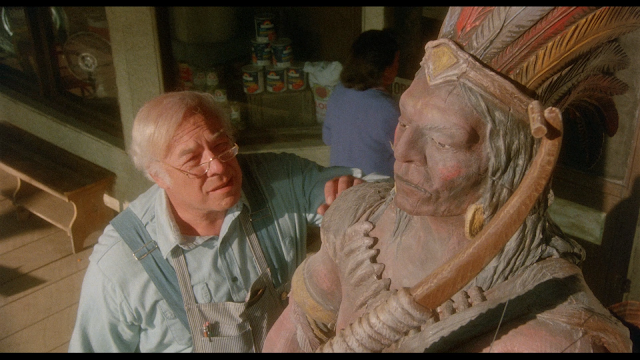 Director Michael Gornick and moderator Perry Martin take us through the making of Creepshow 2. This is a pretty good commentary and meets all the requirements of being such. Martin does a good job at keeping the track on track (no pun intended) and a lot of information is learned. 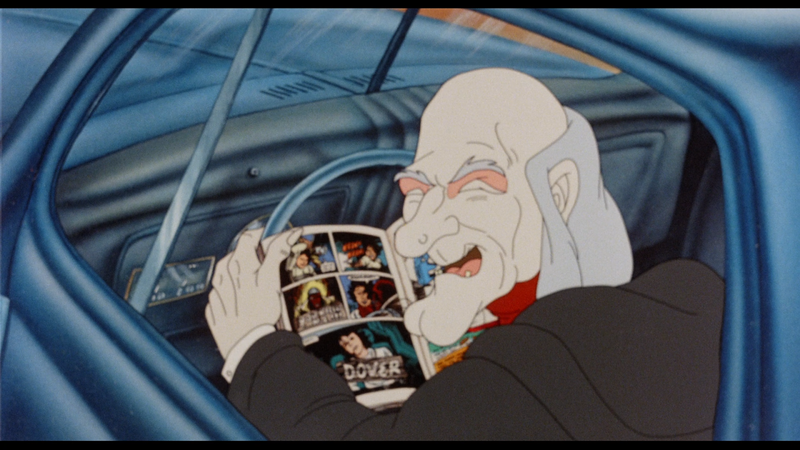 This is the same commentary track that was found on the Anchor Bay dvd. This is a lovely package that Arrow has put together for us. The first thing that you will notice is how striking the artwork is. There is a shine to it that we don’t normally see on blu-ray releases anymore. The cover shows the Creeper reading the Creepshow 2 comic book and in a cloud of smoke, various images from each of the stories are seen. This outer box is red with Canadians getting a purple version. Inside the outer box is the normal amaray case that we have come to love from Arrow. The front cover is the same as the outer box, just this time it is purple. The inside box is red for Canadians. 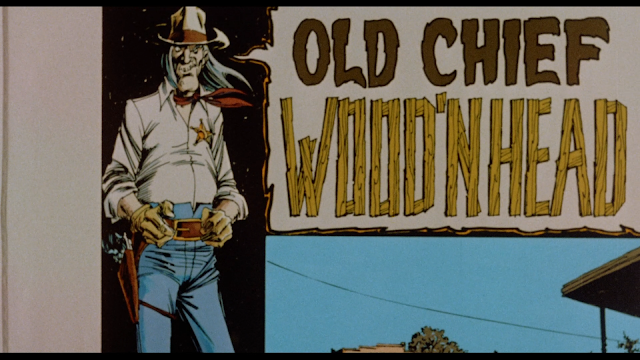 The reverse cover is the original theatrical poster of the skeleton wearing a thin cloak, sitting in a movie theater pointing to the screen. There is also a booklet inside the amaray case that contains an essay, Deadtime Stories by Michael Blyth, and information about the restoration. The disc art is the same as the front cover. All in all, this is a great package and I hope that Arrow keeps this coming in 2017 and beyond. Like Hellraiser III: Hell on Earth, Arrow has been under fire because of what some see as a framing issue. 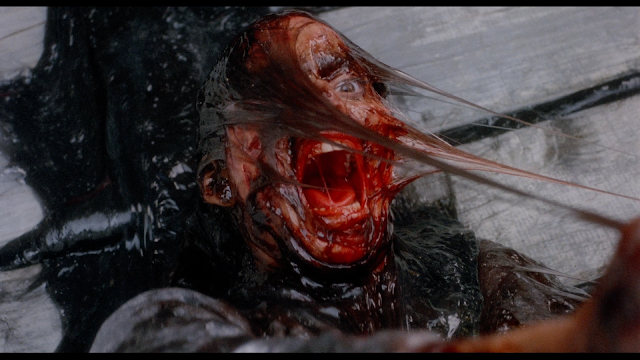 If you remember, Hellraiser III’s framing was moved to the left, sometimes revealing things the filmmakers never intended anyone to see. While this framing didn’t really hurt the viewing of the film (the scene in question goes by so fast that it is a wonder who it was found in the first place) there were a lot of fans who swore off of Arrow releases because Arrow did not issue a recall. While I am a purist and want all of the blu-rays that I buy to not have any problems with them in terms of picture quality, framing, music cues, etc, I didn’t really see the point in the level of hate that was lobbied at Arrow. It was not their fault (it was Lakeshore Entertainment that is to blame) and they had no incentive to issue a recall. 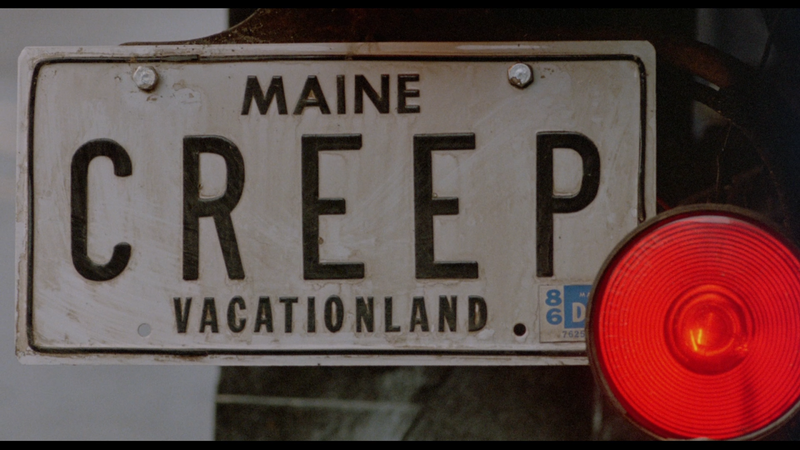 So when Creepshow 2 was released on blu-ray in December 2016, there were already people waiting with their keyboards ready. They knew that Creepshow 2 was a Lakeshore Entertainment property, so they knew that the framing was going to be off. They wanted to be ready to hurl the hate at Arrow yet again. Credit goes to Adam Tyner over at dvdtalk.com for this image and clarifying what everyone else is trying to say. 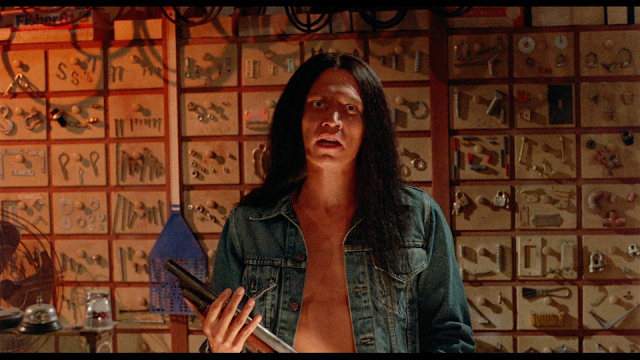 The framing for this release of Creepshow 2 is different, it isn’t “off” nor is it “wrong”. It appears that the Image blu-ray release (and 88 Films as they used the same master) is wrong. The image is cropped on the Image release. Lakeshore knew this and fixed it when they scanned the negative. 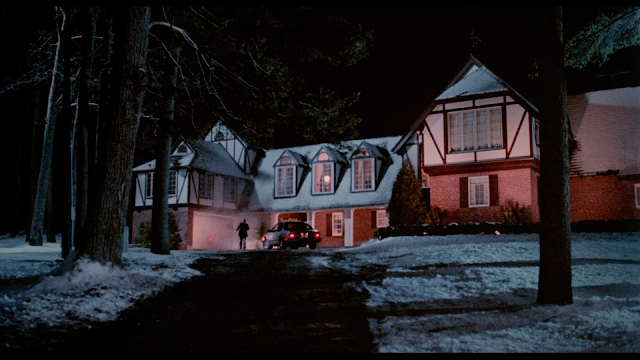 The transfer on the Arrow release is the best I have ever seen the film look. 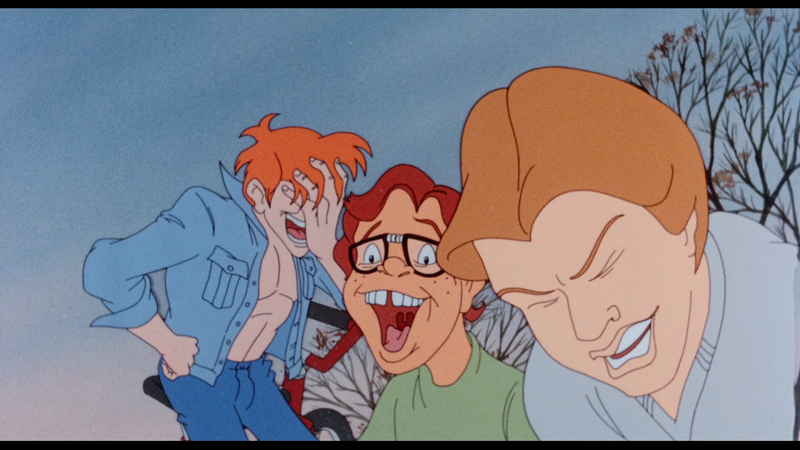 Colors pop and the film doesn’t looks like it takes place at night anymore. The Image release was dull and murky, while the Arrow transfer is beautiful and full of life. This is a wonderful transfer and it is always good to see that there are people out there who still care about framing and the way a particular film is supposed to look. I wasn’t really that bowled over with the sound on this release. Dialogue is crisp and clear and I didn’t hear any problems. Given that, I should have given the film a four star rating, but I can’t. While the sound is good, it is the surround that suffers. This is an incredibly lifeless track. Almost nothing is going on around us. I didn’t expect this film to be a showstopper in the sound department, but I expected something. At the end of the day, though, the soundtrack is fine. I just wanted it to be better than fine. 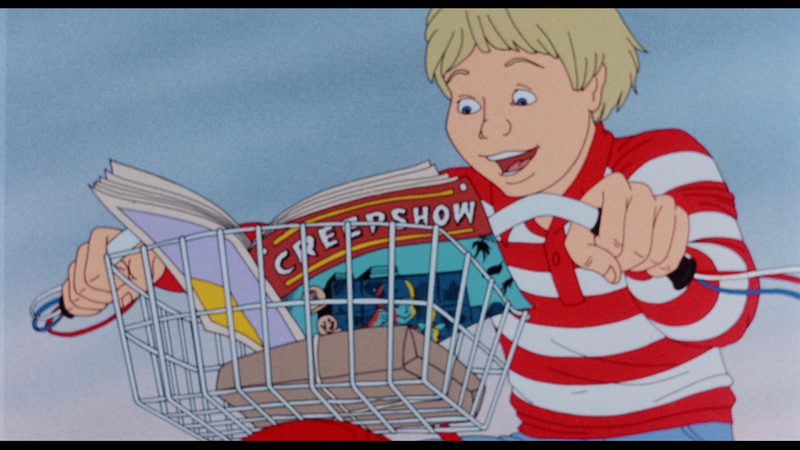 Creepshow is not one of my favorite films. It isn’t even one of my favorite anthologies. I found this first film to be way too dry for my tastes. 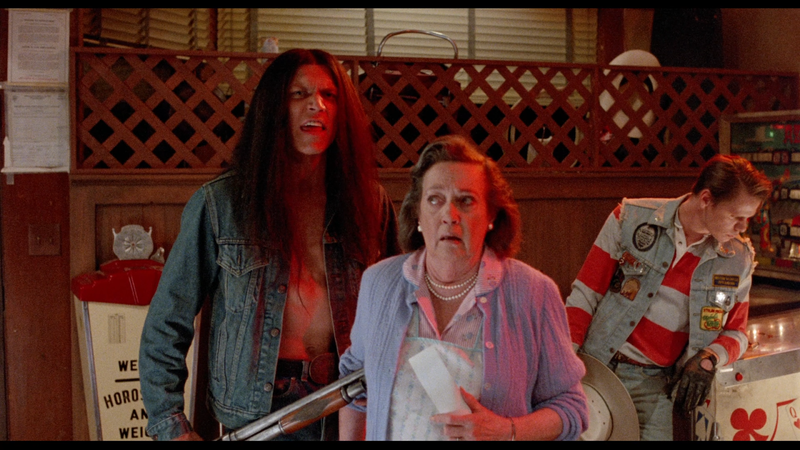 I guess that it doesn’t help that I was brought up with the Tales from the Crypt TV show and only saw Creepshow for the first time a few years ago. I don’t hate the original Creepshow, I just find it dull. I have to say that I was pleasantly surprised by this film. The stories still aren’t the best, but I have seen a lot worse than what this film has to offer and I can say that there is something good about each of the stories. The first story is “Old Chief Wood’nhead”. 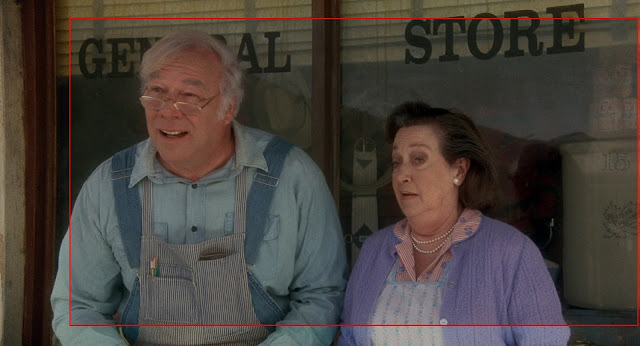 Here we find an older couple who run a convenience store in the middle of the desert. 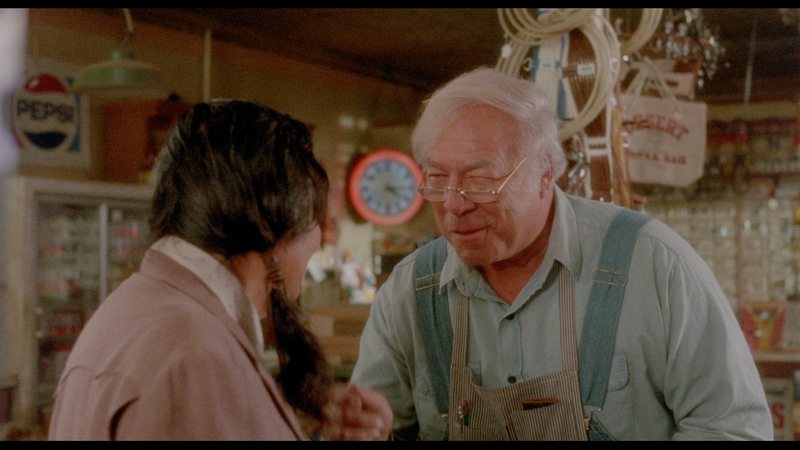 The husband (George Kennedy) loves working at the store even though they don’t get very many customers. The wife (Dorothy Lamour) wants to sell the place and retire. The husband doesn’t want to have any of that. 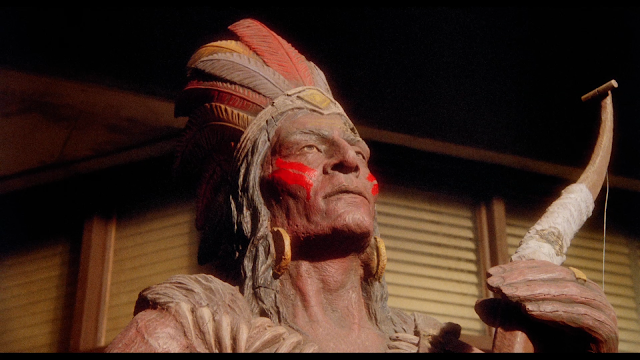 He just wants to redo the war paint on the old Indian chief statue outside the store and be left to peace. 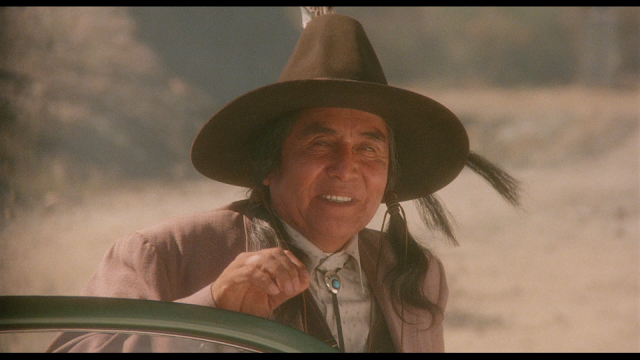 Soon the head of one of the tribes comes to visit the couple. He gives them a bag full of jewelry and other important items that he collected from the tribe to repay money they owe to the couple. The husband will hear nothing of it until the chief tells him that it would be offensive if the husband didn’t take the bag. On his way out the chief pays honor to the statue. That night, three kids (not really kids. Just can’t find the right name for them) come into the store and rob the couple of everything, including the bag of jewelry. One of the kids gets a little too trigger happy and shoots the couple dead. The only witness to this crime was the statue and we know how this is going to end. 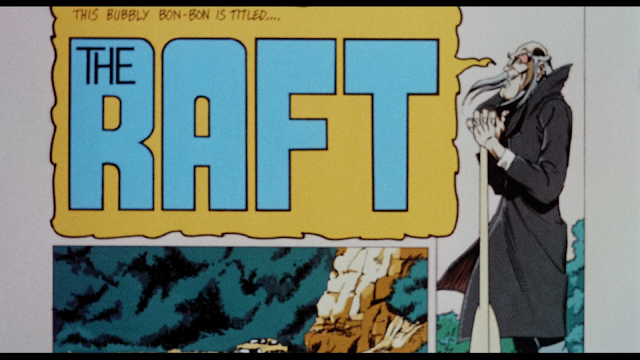 Next up is “The Raft”. This is the story that everyone I know loves. 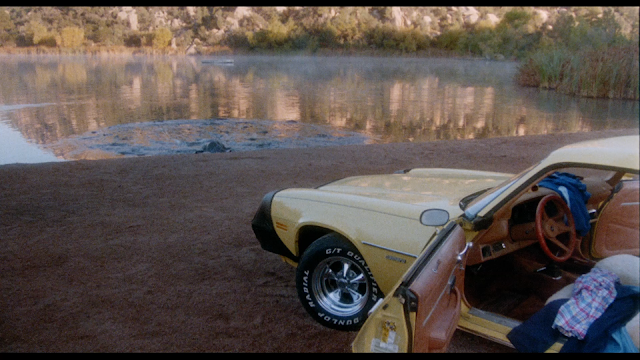 It tells the tale of two couples who go out to the middle of nowhere to go swimming. The notice something that looks like an oil slick on the other side of the pond. As it grows closer, the two couples swim over to a wooden raft in the middle of the pond. They are stuck in the middle of this pond while the oil slick keeps floating around them. One of the girls gets too close and the slick pulls her in. As the oil slick devours her, she pops up and keeps saying “it hurts” to the rest of her friends. 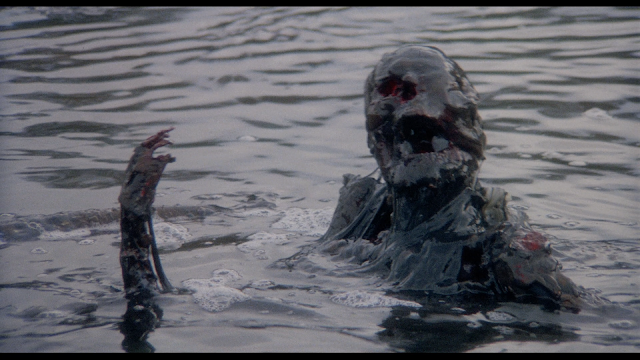 As time goes on, the oil slick devours the rest of the friends. I have no idea what the moral of this story is supposed to be. I guess that one could say that the group were a bunch of assholes so they had it coming, but usually there is something tying the victim and killer together. In the last story, the statue went on a revenge killing because, not only were his people disgraced by what the kids did, but so were the couple who ran the store and kept the statue up. In “The Raft” there is no morality at play. 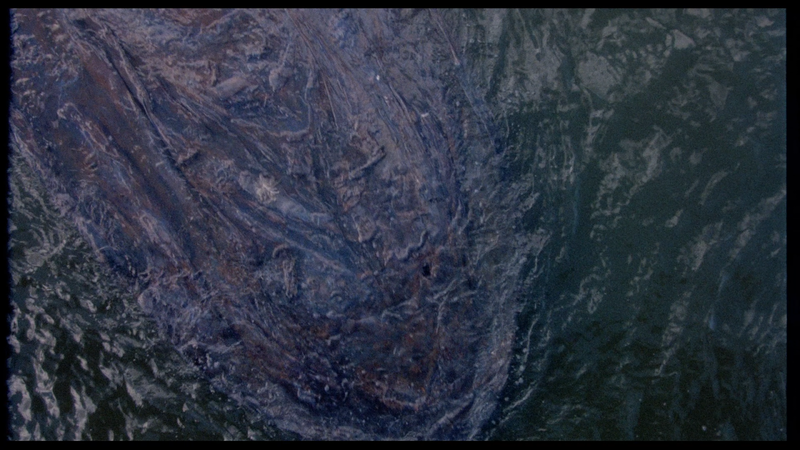 This oil slick has no hand in the game. It is just there when the couples happen upon it. It just seems like this story could have been written a lot better. 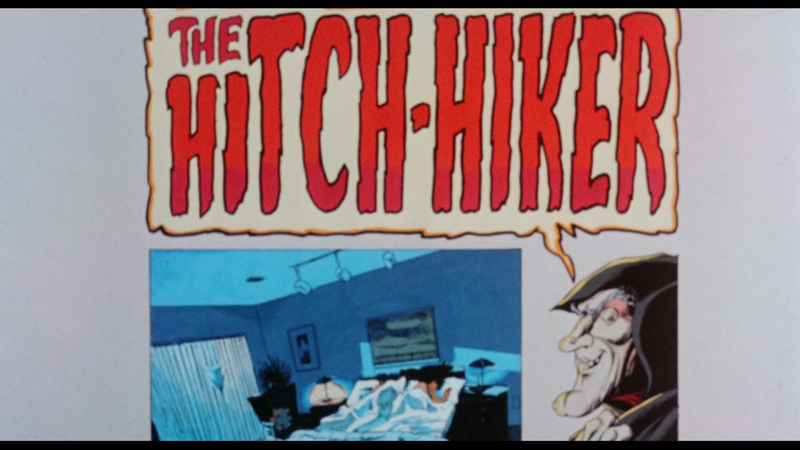 The last story is “The Hitchhiker” and this is my favorite story, so much so that my wife hates hearing me say “Thanks for the ride, lady” any time she does something weird. The story here is about a rich lady who is cheating on her husband with a male whore (?). On her way home, she drops her cigarette. While trying to find it she hits a man who was trying to hitchhike. 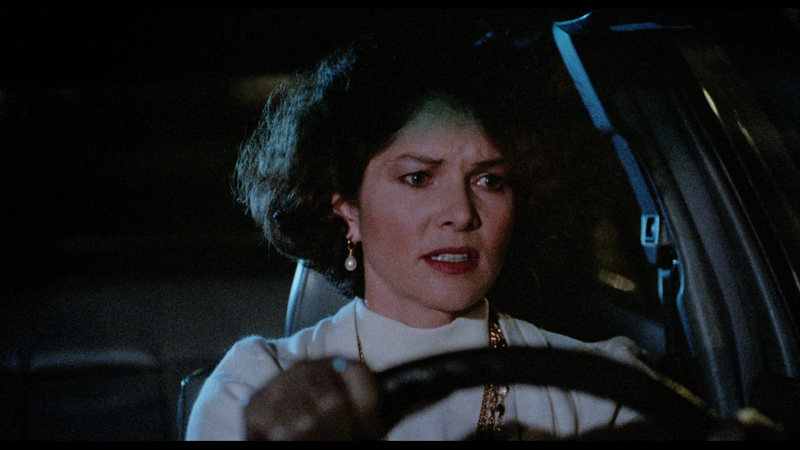 She freaks out and speeds away, thinking that the man is dead and she won’t have to worry about it. 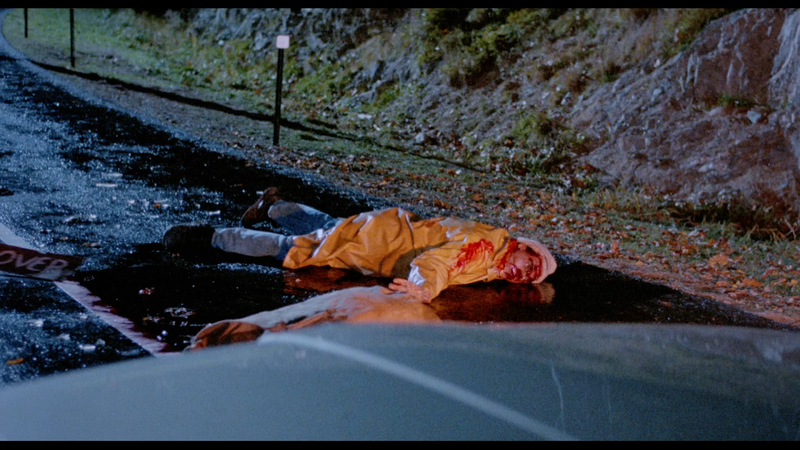 Soon after, the hitchhiker shows up and says “Thanks for the ride lady” She tries to kill him again and then the same thing happens. This goes on for the whole story. It gets really ridiculous when she is driving through the forest trying to lose the hitchhiker. The last few shots of this story are priceless. 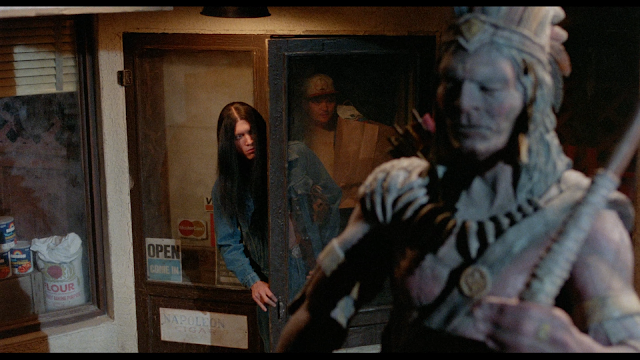 As anthologies go, Creepshow 2 rates above most of the crap that is being made today, but isn’t as good as Cat’s Eye or Trick ‘r Treat. The first story is you basic revenge story. There is really nothing new here. The second story, “The Raft” is entertaining, but gets really stupid and pointless. The third story is the best one. The constant harassment of the rich white lady is really well handled and kind of scary. The effects on display here are fantastic. The statue, when in movement, actually looks like it is made out of wood. What happens when the oil slick takes people is pretty graphic and terrifying. The stages of make-up that the hitchhiker has to go through are really realistic and funny at the same time. A lot of people crap on this film. I liked it. I can see why though. This film doesn’t have the stories that the first film did. Sure, the stories here are a bit more memorable, but they don’t have the resonance that the stories in the first film had. This is a well made film that should get another look. I think that many people will find this film better than they remember. Creepshow 2 is not a great film, but I have seen far worse. It is worth a watch, though. Arrow has done a fantastic job on this blu-ray release. 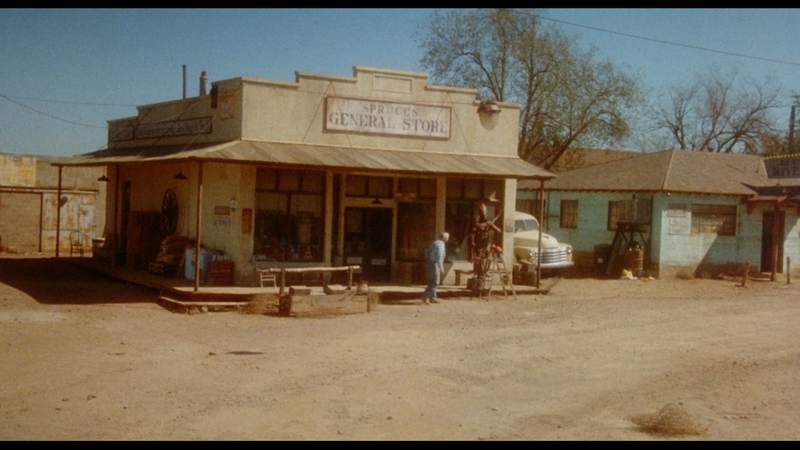 We finally have the right framing on the film and it looks really good to boot. The sound is lacking, but I didn’t find it to be a huge problem. The special features are worth the watch, but it is the packaging that takes the gold here. I hope that Arrow does more releases like this.